Renewable energy is the preferred choice of most environmentalists and conversationalists and so there is a growing increase towards the shift to use solar hot water for home. However, you may wonder as to why you should install this in your home. Solar hot water heater makes use of the inexhaustible source of energy, and that is sunlight, which you get in plenty. Apart from this, it is an environment-friendly option to keep your rooms warm during winter. What are the top 7 reasons to go for solar hot water connection in your home during winter? Utility cost savings: One of the first things that you can think of is the savings that you can do on the utility costs. When you consider the savings for a month it might not be a lot, but when you think about a year or couple of years you will surely be saving a handsome amount of money. 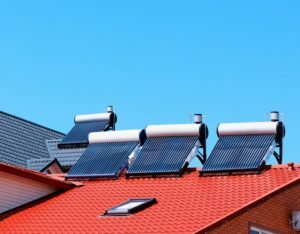 You can get energy rebate: If you have solar water heater in your home you can get energy rebates as most governments across the world are awarding for this cause. The procedures vary from state to state and getting this rebate can only happen after you use this feature for hot water over a period of time. Saving the environment: We now realize how important it is to save the climate because we see the global warming happening in front of our eyes and millions of people are losing lives due to this problem. Solar energy is clean energy and so every day you are able to get hot water without having any negative effect on the environment. Apart from this, you do not need any electrical source for harnessing this energy, as a result of which, you can save on your monthly expenses. Apart from this, by using solar hot water system, the rate of carbon footprint is also reduces, and the greenhouse effect is reduced to a large extent when you use solar water system. Apply for tax credits: The qualified properties can apply for tax credits in most of the countries that have at least converted 50% of the energy to use to heat water from solar. If you find that you property fits in the norms set by the IRS in your country then you are definitely in for some more money in your pocket. You protect the air quality: Most homes use electricity for heating the water, but in countries like US 1/3 of the electricity comes from the burning of coal. This burning causes number of negative effects to the environment. When you use the solar hot water then you are one of the people that are using the natural means to get hot water, and if you have a high quality hot water cylinder with the best oil systems, then you can get hot water in a faster manner. Increased home value: The homes that install the solar hot water in homes get increased value for their home. In a longer period of time this works out to be a great investment that provides effective results. The homes with solar also sell faster and so there is no need to worry about the investment. Protecting the water quality: Particulates and carbon are not the only bi-products of burning fossil fuel. The research also points out the power plants being the primary reason for mercury, and other toxic metals that are released in the environment. However, with solar hot water you are able to contribute from your end towards a green energy and protect the water quality as a result. This entry was posted in Green Real Estate, Home Improvement and tagged Green Energy, Homes With Solar, Inexhaustible Source of Energy, Renewable Energy, solar hot water, Solar Hot Water Heater, Solar Water System. Bookmark the permalink.